What is the best way to jack up your car to change a tyre? The jack supplied with your vehicle is designed by the manufacturer only for raising the vehicle to change a tyre in an emergency. Don’t even think about using it for anything else! No matter what jack you are using, you should never rely on it if your life is on the line, and only get under the car once jack stands are holding it securely. You could receive serious injuries working under the vehicle using a jack as the only means of support, and OEM spare tyre jacks fail or allow the car to roll with alarming frequency. 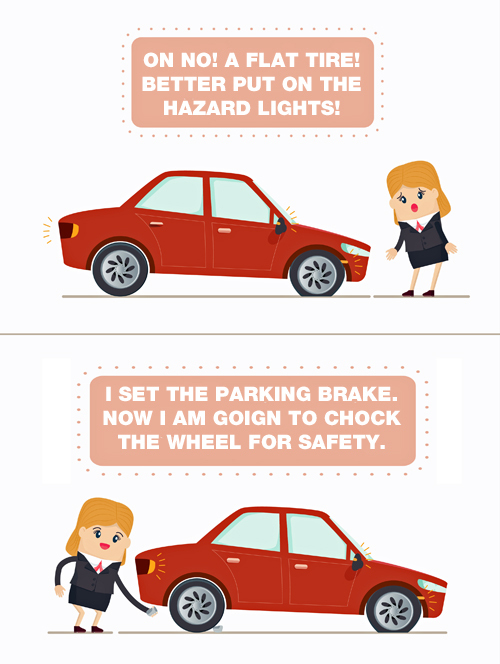 Park the vehicle on stable, level ground and block the wheels. Put the transmission in Park (automatic) or leave in gear (manual) and set the parking brake (both). Locate and remove the jack, lug wrench and spare tire from the car. If they are not in the boot, check behind storage panels in the cargo area or under the back seat. Occasionally they are also stored under the bonnet next to the motor or under, or behind, the front seat of a pickup truck. Never work under the car while using the factory spare tire jack. Remove the centre cap or wheel cover if needed to expose the lug nuts. 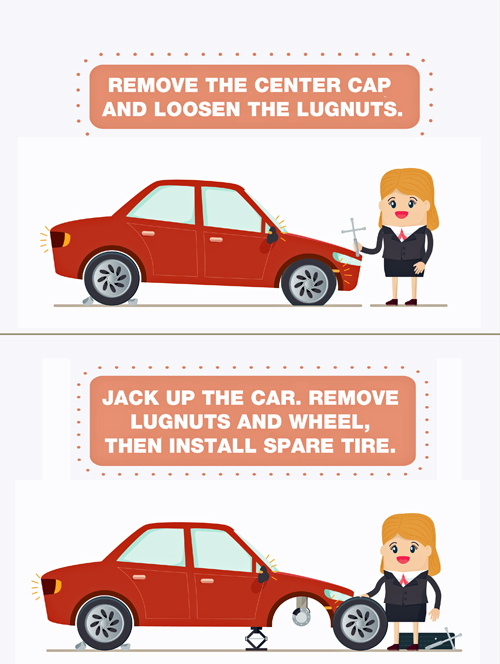 Break the lug nuts loose before you raise the vehicle. Locate the proper lifting point. On most vehicles, it is a notch in the seam that runs under the rocker panel, or lifting pads behind the front wheel opening or in front of the rear wheel . If you can’t locate the factory jacking point, refer to your owner’s manual. Solid axle rear drive vehicles often are lifted by the axle or spring pad on leaf springs. Place the jack in position under the vehicle and adjust the height by hand until it fits the notches in the rocker panel flange - or touches the lifting pad - nearest the wheel to be changed. Insert the handle and operate the jack with a slow, smooth motion until the wheel is off the ground. Remember to lift it high enough so the inflated spare tyre will fit. Remove the lug nuts, pull off the wheel, install the spare and thread the lug nuts back on finger tight. Tighten them snugly with the wrench in a criss-cross pattern, but wait until the vehicle is lowered to tighten them completely. If your vehicle is equipped with a small temporary spare tyre, remember that it’s intended only for temporary, lower speed use. If not otherwise marked, do not exceed 50 mph while using the temporary spare.